"The Kotlers have written a much needed, up-to-date, comprehensive road map for effective leadership. There is a rich lode of stories and strategies for the museum executive in a digital worlda tour de force." "The most comprehensive and insightful guide to effectively addressing the challenges facing museums in the changing and uncertain global, digital, and consumer empowered environment. 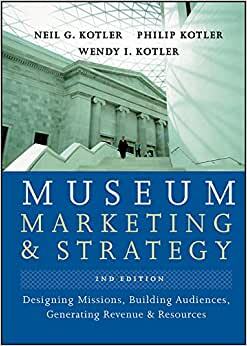 Illustrated with a trove of rich cases of model museum practices around the world, this book is a must-read to all museum management and boards." Neil G. Kotler is the president of Kotler Museum and Cultural Marketing Consultants, Arlington, Virginia, and a former museum professional at the Smithsonian Institution. Philip Kotler is?the S.C. Johnson & Son Professor of International Marketing at Northwestern University′s Kellogg School of Management in Evanston, Illinois. Wendy I. Kotler is an educator and museum consultant of long–standing. She is vice president of Kotler Museum and Cultural Marketing Consultants. Fantastic book. This book provides a comprehensive overview of the tools needed for museum and cultural heritage marketing. 5.0 颗星，最多 5 颗星Would definitely recommend it! Very informative. Would definitely recommend it! !